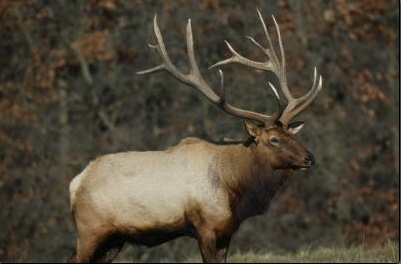 Elk are larger than white-tailed deer. They have a reddish hue to their fur, a buff rump patch, and small tails. Males have antlers, but the females typically do not. Elk were once found throughout the state but were gone from Illinois by the early 1800s. Today, they are held in captivity by landowners and some occasionally escape. There are no wild populations of elk in Illinois. If you have seen a free-ranging elk in Illinois, please report the sighting to the Illinois Department of Natural Resources.